This season's 29 concerts take place in a variety of dynamic venues, including the Historic Asolo Theater, Sarasota Opera House, Venice Performing Arts Center, Michael’s On East, Symphony Center/Holley Hall and the Plantation Golf and Country Club. Several of our concerts take place in the remarkable setting of the Historic Asolo Theater. Comfortable seating, excellent acoustic and sightlines combine with the theater’s jewel-like setting to create an ideal space in which to enjoy world-class musicians. Sarasota's most storied theater was created in 1798 in Asolo, Italy, brought to Sarasota in the early 1950s and painstakingly restored in 2006. 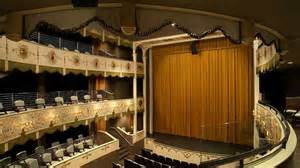 The Historic Asolo Theater remains one of the most beloved treasures in The Ringling’s collection. 5401 Bay Shore Road, Sarasota. Artist Series Concerts is delighted to return to the historic Sarasota Opera House this season. This striking hall recently underwent a $20-million-dollar historic renovation—designed to restore the 1926 theater to its original glory, while creating a venue for state-of-the-art, 21st-century opera and concerts. Decorative details have been restored, seating has been replaced, and the orchestra pit almost doubled in size. Backstage systems have been updated and public areas and amenities expanded and enhanced. Enjoying a concert in this distinguished hall is truly a vibrant, unforgettable experience. 61 N. Pineapple Avenue, Sarasota. We’re delighted to present concerts at the state-of-the-art Venice Performing Arts Center. This beautiful 1,090-seat, multi-level auditorium located on the island of Venice, features a 2,000-square-foot stage and automated orchestra pit. The VPAC boasts the ability to accommodate up to 50 color-changing and moving LED lights in addition to a 12-panel acoustic shell around the stage, which allows the entire building to be acoustically tuned. 1 Indian Avenue, Venice. Artist Concerts Series’ very popular “Lunch & Listen” series of four performances combines nourishment of three senses with imaginative luncheons, varied visual components, and professional musical presentations. Presented in Michael’s On East’s stunning ballroom. 1212 S East Avenue, Sarasota. This season we are also presenting two “Lunch & Listen” concerts at the Plantation Golf and Country Club, a premier facility in Venice. Warm tropical tones and rich cherry wood accents offer audiences a soothing ambience to enjoy a memorable dining and entertainment experience. 500 Rockley Boulevard, Venice. Our three-concert Soiree Series is presented in the music room of a one-of-a-kind residence in Sarasota. Our audiences enjoy not only high-quality musical entertainment, but also the ambiance of enjoying the music in a private setting. Each soiree experience is enhanced by delicious light foods and beverages. The room comfortably accommodates 75 guests and boasts three large grand pianos, including a Steinway Concert Grand; and two restored pipe organs with more than 2,500 pipes. The Fischer-Weisenborne residence is located at 7459 Cabbage Palm Court, Sarasota. Holley Hall is located in the Beatrice Friedman Symphony Center on Van Wezel Way, a short street that runs between Boulevard of the Arts and 10th Street, one block west of U.S. Highway 41/Tamiami Trail. There is an elevator to the second floor balcony.